Haas-Lilienthal House, San Francisco. Courtesy of San Francisco Heritage. 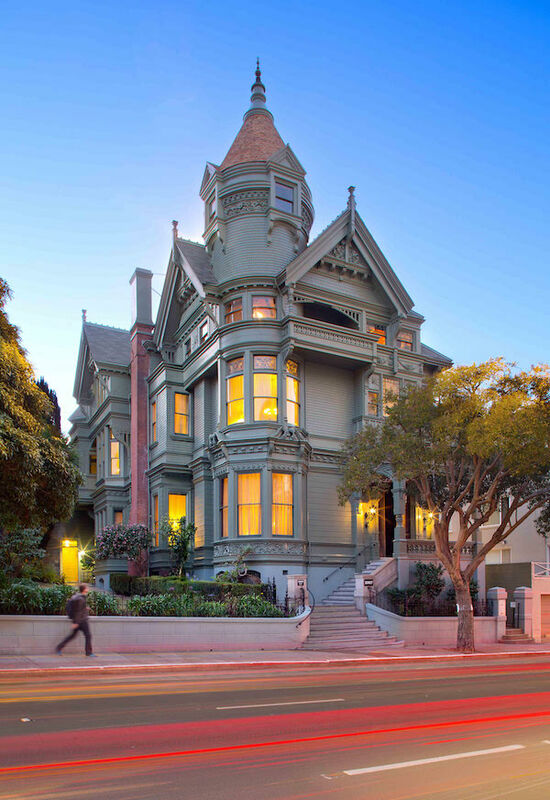 Over the past two years, I’ve been working with San Francisco Heritage to explore how the Haas-Lilienthal House, the 1887 Queen Anne house it owns and operates in the Pacific Heights neighborhood, can engage the public and advance its citywide mission in ways that are both environmentally and financially sustainable. Just as the Haas-Lilienthal House was rocked by a tremendous earthquake in 1906, so are historic sites today, although in a different manner. The economic downturn that began in 2008 threatens many preservation organizations, house museums, and historic sites, even those that have large endowments and attendance. But the change is bigger than the latest economic recession. Surveys over the past thirty years by the National Endowment for the Arts show that visitation rates at historic sites have fallen from 37 percent in 1982 to 25 percent in 2008, and that rate of decline has only accelerated in the last decade. The Haas-Lilienthal House is experiencing a long and steady decline in attendance—it’s fallen by more than 50 percent over the past thirty years. Historic sites not alone, however: concerts, dance performances, craft fairs, and sporting events have all seen similar declines in attendance. As a result, many historic preservation organizations around the country are questioning the value of owning historic property. Guided tours and public programs do not generate sufficient revenue to properly maintain historic sites, so unloading them seems to be the only solution. But there are also significant disadvantages. When a preservation organization owns an historic building, it instantly conveys credibility. (Would you trust a surgeon who has never held a scalpel?) Secondly, by owning and caring for an historic property, organizations like San Francisco Heritage are doing preservation, not just talking about it. Historic preservation is both a process and a product. Finally, by owning an historic property, preservation organizations can demonstrate their ongoing value. Rehabilitation is one of the greatest opportunities for historic buildings—it’s the ultimate form of recycling—and a serious challenge. The Haas-Lilienthal House is a complex preservation project that fulfills several purposes: it continues as a residence, providing both a home for a young family and stable income to Heritage; it serves as offices for Heritage in an era when many non-profits are being forced out of the city; and it is an immersive setting where tourists and local residents can learn about the history of San Francisco and how preservation makes for a great place to live, work, and explore. In the next few months I’ll be concluding a year-long interpretive planning process that is pulling together the organization’s mission, history of the site, preservation philosophy, and audience interests to identify the most effective ways to engage the public, which can include tours, exhibits, events, publications, web sites, social media, and new technologies. The process is just as important as the final product and over the months we’ve held lively discussions about the significance of the House, the impact we want to make on visitors and the community, our willingness to experiment and take risks, and the interests and needs of tourists and residents. Participating in the project is an impressive team of scholars and consultants, including Fraidy Aber, director of education at the Jewish Contemporary Museum; Mark Brilliant, associate professor of history, U.C. Berkeley; Robert Cherny, emeritus professor of history, San Francisco State University; Michael Corbett, architectural historian; Donna Graves, public historian; Barbara Henry, former chief curator of education at the Oakland Museum; Jackie Krentzman, producer of American Jerusalem; Margaretta Lovell, professor of American art history, U.C. Berkeley; Laura Mann of Frankly, Green + Webb; and Fred Rosenbaum, author of The Cosmopolitans: A Social and Cultural History of the Jews of the San Francisco Bay Area. 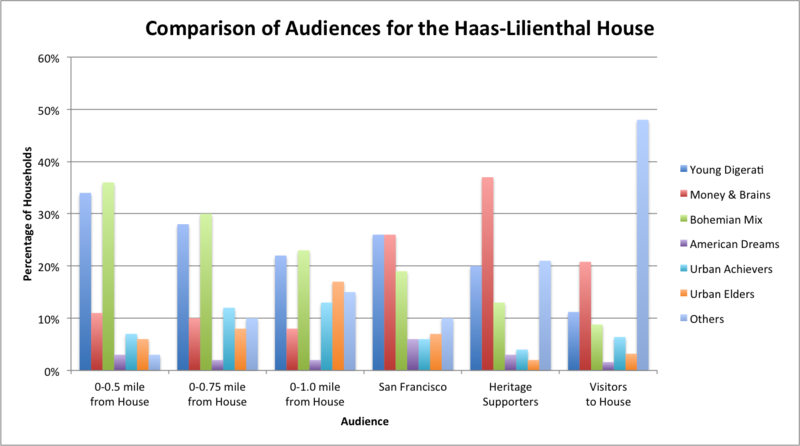 An analysis of the different audiences of the Haas-Lilienthal House. The interpretive planning process also studied the people who visit the House, support Heritage, and live in San Francisco. The plan will identify the primary audiences that are key to Heritage’s future success—and describe how the House can play a crucial role to this historic preservation organization. For example, a lifestyle analysis conducted by Nielsen (the television ratings company) showed that the neighborhood surrounding the House is dominated by the “Young Digerati” (ages 25-44, highly educated, tech-savvy, affluent, ethnically diverse, living in trendy apartments and condos) and “Bohemians” (under 55 years, ethnically diverse, progressive, early adopters, living in funky rowhouses and apartments), providing an ideal opportunity for Heritage to reach two major but untapped groups in San Francisco. Over the next few years, Heritage will be revising tours, events, and school programs to implement the plan. For example, Common Core standards will be integrated into the popular Heritage Hikes program for third-grade students. Heritage is already experimenting with new or unusual ideas, such as Mayhem Mansion, which sold out in its first two seasons and has introduced the House to an entirely new, local audience (those Bohemians and Young Digerati!). As the 21st century progresses, historic preservation and house museums will need to continue adjust and change their strategies for connecting the past and the present. Although history doesn’t change, its relevance and meaning does evolve depending on the contemporary issues that face society. Our shared identity as Americans serves as a stronger bond than occupation, religion, race, and ethnicity, suggesting that preservation organizations have enormous leverage. While some might assume that historic preservation is solely concerned about the past, it’s actually focused on the future—what we share, remember, and carry to the generations that follow us that will make their lives better. Our hope is that the Haas-Lilienthal House will always serve as an active and lively bridge across the generations. This entry was posted in Community engagement, Governance and management, Historic preservation, Historical interpretation, Strategy and tagged Barbara Henry, Donna Graves, Fraidy Aber, Fred Rosenbaum, Haas-Lilienthal House, Jackie Krentzman, Laura Mann, Margaretta Lovell, Mark Brilliant, Michael Corbett, Robert Cherny, San Francisco Heritage on December 3, 2015 by Max van Balgooy. Wow, this sounds like an incredible project. I look forward to hearing more about it and reading the documents developed as part of the planning process. I do know that when I took “your” Great Tours workshop at the 2004 NTHP annual meeting that it was transformative for me in terms of my thinking and approaches to cultural heritage presentation and interpretation. The one thing I will say, which is outside of the scope but should be raised, is that communities need to consider cultural heritage interpretation and presentation from a more comprehensive and integrated fashion, including funding. Almost 10 years ago, I wrote a memo about this in the context of DC-related issues, and I think it is relevant to most places, although similarly, most localities have significantly challenging budgetary situations. Still, conceptualizing both public and private cultural assets as part of a system, part of a whole, creates the stage for considering broader funding options. Thanks, Richard. I agree with you that interpretation needs to be more holistic, not only in terms in historical content but also in management. Excellent programs won’t survive and have an impact unless they are financially sustainable through participant fees, contributions, or earned revenue. Ironically, most grant programs don’t ask about financial sustainability nor ask for revenue estimates in their application forms, so they may be unintentionally encourage the assumption that interpretation and educational programs are just about spending funds. And thanks, too, for the kind words about the Great Tours workshop. I always appreciate hearing how these workshops affected the participants (and more is coming soon—I’m working on a new book on interpretive planning at historic sites).